The Icelandic government says it has come to a new agreement with the governments of the Netherlands and the UK over the repaying of $5bn (£3bn). A law to reimburse funds paid out by the two governments to those who lost money when online bank Icesave's owner collapsed in 2008 was passed in August. The UK and Netherlands disagreed with the terms, meaning a new bill will go before Iceland's parliament on Monday. 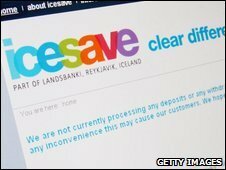 About 400,000 savers lost money when Icesave owner Landsbanki collapsed. The Icelandic government said in a statement published on its website: "An understanding has been reached with the UK and the Netherlands." Iceland's Prime Minister Johanna Sigurdardottir said the government believed the new law would be adopted by parliament. At a press conference, she said a review by the IMF of its $10bn bail-out programme would take place before the end of the month. There has been particular anger that the UK used anti-terror laws to freeze Icelandic banking assets in the UK when the crisis began last year. UK Chancellor Alistair Darling was also accused of undermining confidence in the Icelandic banks. Iceland eventually had to take over its three biggest banks - Glitnir, Kaupthing and Landsbanki. Iceland hopes that the agreement to make payments to the UK and the Netherlands will help it to get more financial aid. It does not cover the money British councils invested in Icelandic banks. They are engaged in a separate process to recover their money, led by the UK's Local Government Association.